We have seen our fair share of application reviews for Windows that change system settings automatically when the computer enters idle state. Most of the applications offer to turn off the monitor, lock the workstation, mute the sound of the system, or even load a program. System Silencer can do that, and more which justifies a closer look. The portable application runs silently in the background upon startup. It can be configured with a right-click on its system tray icon and the selection of Show / Hide Configuration menu from the context options. System Silencer adds a wealth of options to the process that extend what Windows itself supports. All available options are listed on the same page. Toggle mute: Mutes the computer. Toggle show desktop: This minimizes all open windows automatically when the computer enters idle stage so that the desktop is shown. Toggle taskbar icons: Hides the taskbar and icons when the computer is idle. Toggle desktop icons: Hides the desktop icons on idle. Hide window(s): Option to select specific windows that are then hidden by System Silencer on idle. Run program / file(s): Launches specified applications or files. Some options can be reverted when the idle state of the PC ends. It is furthermore possible to specific actions individually for desktop and battery mode. The idle time can be configured individually for each action as well. System Silencer offers several interesting options. Especially the ability to hide elements on the screen, configure different idle times for actions and the option to revert changes should make it interesting for the majority of users. You could use the program to hide certain program windows or even kill some processes when the system enters idle state. The former could be useful to hide programs when you leave the workstation, the latter to make sure that certain programs are not running when you are not near the computer. 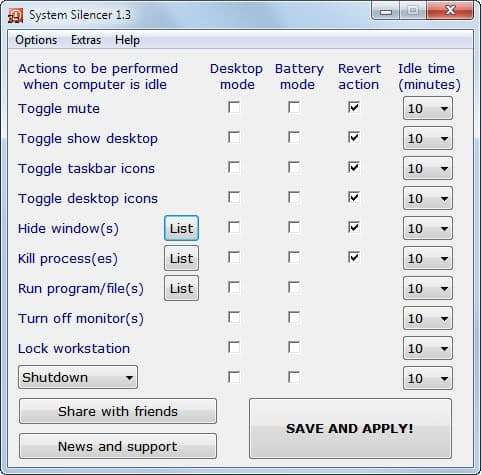 System Silencer is a useful program for Windows that adds a range of new options to the system when it enters idle state. Especially the options to hide program windows and to kill processes need to be mentioned in this regard as they are not supported by the majority of applications out there.